In honor of Earth Day 2019, we’d like to give you 4 easy tips for reducing your impact on the environment as you plan your wedding. The most important thing you can do to reduce your impact on the environment, choose a green caterer. Our top recommendation for full service green event catering services in Oregon is Artemis Foods Catering & Events. If you want to know your caterer is incorporating green principals in every aspect – from locally sourcing seasonally available menu options, to cleaning reusable dishes with environmentally friendly cleaners to cleanup and reduction of waste practices, to paying fair wages, look no further! The great news is so many of our local caterers and restaurants who offer event catering are also green in their practices. You are not limited! The key is to select a menu that is in season, with local sources for as much of your food and drink options as possible. Our friends over at Glitch Films offer love story edited films for your social media, wedding website and digital Save The Dates and Wedding Invitations. Order a few locally made, specialty invitation suites for those on your list who will save and treasure your invite, and use a service like Paperless Post or GreenVelope to send the rest of your list green paperless invites, you can customize your invites with your film (GreenVelope, out of Seattle, will support custom video invites). Green traditional floral foam is a freakin magical genius design tool when designing wedding arches, dramatic centerpieces, and backdrops. But wedding foam is absolutely horrible for the environment! You may need to use it in your arch, depending on weather conditions, floral colors, and time of your ceremony vs. when your arch design must be installed. Nobody wants to sacrifice the beauty of their wedding, and you don’t have to. But limit how much your floral designer has to use. Everything in the above picture is dried! This design was built in wooden boxes in sand. There are so many options for dried or preserved or painted florals to be used in your design. Spray painted babies breath clouds are a favorite this year. And individual flowers can be added using water tubes to remain fresh. It’s easy to design centerpieces without foam. Or there are alternative foams which will biodegrade faster and cleaner than green foam. We offer green designs using as many locally sourced and green principals as possible while not sacrificing the look you want. If you pay us to handle the striking and clean up of your floral design (extra charges involved) we will recycle and reduce the amount of waste left behind. We also dry most of the flower petals from fresh florals left over. These are re-used for floral confetti, dried floral aisles, etc. If everyone did this one simple thing the impact on global conflict and ethical sourcing would be unbelievably profound. We have several jewelers locally who offer antiques, conflict free, and other ethnically and environmentally positive options for your wedding rings. I have not found a better source anywhere near or far than the amazing local company Mia Donna! This story of a local mom trying to do her part to change the world is phenomenal. I honestly don’t know why anyone would look elsewhere for their rings. They have it all from ethical to affordable, to absolutely jaw dropping, it’s all in one place! If you’d like to learn more about planning a green wedding, contact us! Sometimes in the off-season, couples are looking for some help with flowers to decorate an intimate wedding. This Sunday’s wedding suddenly turned in to a large gathering, testing the capacity of Elephants on Corbett! Sometimes you think nobody will come to your wedding if you get married in April, but what other fun things are competing for our attention and social calendars? Nothing! Simple decor is all you need with the beautiful stained glass backdrop. The reception was just a few minutes away at Elephants on Corbett. They had 12 tables + a sweetheart table and still room for a buffet. The Sweetheart Table looks bare in this photo – the family was transporting the garlands from the church to the reception later. And the bouquet would be placed in the empty vase (always a great cost-saving pro tip). A picture of the bouquets. Simple corsages for the moms and grandmas. A few of the boutonnières. The cake and cupcakes were delivered by The Cakery in Hillsdale, we set them up and decorated the three tiers. Again, pro tip, the toss bouquet doubles as a pretty extra pop of decor at the dessert table. On your wedding timeline, typically bouquet toss comes right after cake cutting so your toss bouquet is there for pictures and handy when it’s time to toss. One of the cake tiers didn’t have a wooden platter, so I decorated all three around the bottom with leftover eucalyptus laid out in rings, and rose buds. Whenever I get pinboards from couples with styled shoot cakes filled with toxic and poisonous flowers, berries and greens I cringe. Styled shoots are not real!! Nobody is eating that cake or they may die people. We will only allow professional bakers to install florals on cakes, or as with this one, we schedule our set up for after the cake arrives to make sure it’s set up safely. All of these materials are not edible because nobody should eat flowers or greens grown in pesticides, processed in floral design chemicals, etc. These items are cleaned, they are not touching the cake at all and they are easily removed before cutting and serving. The centerpieces were a favorite for this year! The wooden box centerpieces are a hot item this wedding season. They’re very versatile, fit with all different color schemes, can be used to line the aisle at your ceremony and placed on tables after. They fit with rustic farm decor and in a ballroom. We are glad they’re here! Ever since the episode of Friends where Joey got ordained to perform Chandler and Monica’s wedding, it’s become more and more of a trend. In Oregon, very few couples opt to get married in a church or to have a religious ceremony. More couples are writing their own vows, opting for non traditional ceremonies blending their own relationship, personal values and personalities. 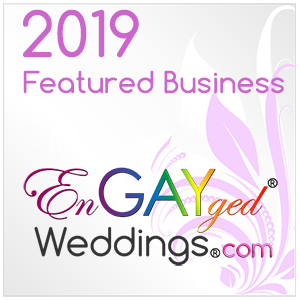 We have several phenomenal local officiants who will perform your ceremony for you and help guide you through the process of creating a custom ceremony. But if you have a friend you really want to perform your ceremony and they agree – what next? A lot of rumors float around on this subject, but the facts are if you live in Oregon and you believe you were legally married, the courts will most likely consider you married. But please do it right! It’s easy to do. I recommend getting ordained online. It takes five minutes and is 100% legal for you to perform a wedding in Oregon if you do. I say this as an ordained Minister of two years. All wedding planners should be ordained, just in case. It’s a great backup plan. I chose The Universal Life Church. It’s super easy, free unless you opt for upgrades like fancy certificates and a book that teaches you how to perform a ceremony. There are parts to a ceremony. Depending on religion or non denominational type of ceremony you are doing, everything from the processional, to where people sit or stand, has meaning. If you are doing a common non-traditional ceremony, plan to have the bride and her immediate family on the left and the groom and his family on the right. Guest seating can still be open, and usually is mixed. Welcoming Comments – most people do not give anyone away anymore. If you do wish to do any form of that this will happen right at the end of the processional. Immediately after the officiant welcomes everyone and gives a brief personalized thank you to everyone there to witness this awesome event – if they haven’t yet, remind them to please be seated before you get too far. The next part I like to call The Officiant Explains It All – This is where having a close friend or loved one Officiate, pays off! The best ceremonies I’ve seen have been a long Mass by an amazing Priest in Little Italy, San Diego in 1998, next was a wedding last year performed by The Matron Of Honor’s Father (a first timer), and Rabi Brian had everyone laughing through a ceremony we did in 2017. There are a million ways to engage the crowd, tell the couple’s personal story and explain the importance of why you’re all here today. The priest gave a speech about the realities, trials and beauty of marriage. I actually sobbed because nothing had ever connected with me more about the importance of marriage – it was beautiful and perfect. The friend wedding was so personal. We learned their love story, his ideas on love and his praises for them as a couple, again, I cried it was fantastic. The best part, he didn’t know how to do this before we talked and all I did was give him a few basic pointers and guidelines. The key is make it personal! Rabi Brian is just brilliant, fun, and great at getting to know his couples and it is engaging for the people there to watch. Exchanging Your Vows – This is where one can have a traditional do you vow to do x.y.z. And you say “I do”, or as is more common today, you can write your own vows to exchange. Don’t wait to start writing your vows. You don’t want to offend your future spouse by winging it. Tips for writing good vows – be very personal. Tell each other when you knew, how you knew, and why and what you will do from now until eternity to be by each other’s side. It doesn’t have to be long. It shouldn’t be too short. And it should take some time to edit, rewrite or reorganize. As one who majored in English and took creative writing courses I can tell you the best writing comes from what you know, feel passionately about, and revisit several times to get it just right. The Only Time Everyone Is Excited For The PDA – You kiss, it can be sweet and soft, sweeping and romantic, you do you! Final Words Announcements and Directions For Guests, A Toast, A Prayer, Clapping, All Of The Above. If you haven’t read our blog post on how to make it legal, do that. Once you’re ceremony is over you have to take a moment with your best people (witnesses) and officiant to sign the license. You may have a fancy keepsake Marriage Certificate that you can keep, but you also have the official document you got from The County Clerk in the state you are marrying in. Sign these! Get pics. It’s a cool moment. Step 4. Send The Documents In! Read the directions for sending the docs in. Some areas require you to go in, usually you just need to mail them in within 3-5 business days. Don’t mess this up. If you have questions call the local County Clerk’s Office and ask. It’s usually very simple and self-explanatory. The full eucalyptus of last year is out, replaced by sparse greenery and lots of gentle florals. Yellow is a big color this year, especially as an accent color. In many cultures it means good luck, so what better color to add to your wedding? In this modern blush sweetheart table we pulled in yellow blossoming branches and yellow in the freesia for just a few little pops. The garden roses went from blush to peach, the ranunculus are blush, and the tulips are very soft blush pink and white. We added pops of wine in the lisianthus and dahlias. The table is set atop the rose velvet tablecloth by bbjlinen. The place setting includes large white dinner plates and small geo-salad plates. We didn’t want to over-do the geo shapes in our design, so while it’s there, it’s subtle, unlike last year when everything was geoshaped. The menus and place cards by elli.com. The concept for this table was to create a lavender design that was zero% rustic. I’m guessing thanks to Pinterest, which we love as a design and planning tool, couples have come to think lavender has to mean rustic. It does not. It’s a beautifully soft, romantic color. Our second goal with this table was to design using green principles. As a certified green wedding planner, who also does floral design, I’ve found the floral industry, as a whole, is deeply flawed. You’d think growing so many plants would be awesome for the environment, and it absolutely can be, and is for some farmers. The difficulty comes from shipping in most of our non-organic materials from all over the globe – such that rarely do we have to say we can’t design with that flower in your wedding month. And don’t get me started on all the floral foam. In this table we used mostly dried materials. Most of the items at this table are not only not alive, but they were first used weeks to months ago, then preserved and reused in this design. Photos cannot do this justice. Especially not from my iPhone. As I said in my blog yesterday, the Sweetheart Table can be filled with coordinating dishes to the rented wares on your guest tables. They don’t have to match! And just like the tradition of the toasting glasses, supply yourselves with water glasses, plates, even flatware you can pull out anytime to bring you back to that sweet moment, alone together, soaking up the joy and love of it all. Here’s my favorite thing about this table – the backdrop. It was hard for my non-photographer brain to capture. So here you go a better shot from today. These pieces can be transferred, and even taken to your home to use as decor and enjoy for years to come. Tropical leaves, bright oranges, pinks and yellows are huge trends for 2019. It doesn’t matter if you’re just doing green tropical palms and monstera leaves alone, with traditional white colors, or adding true tropical flowers like birds of paradise, princess protea, and ginger. We used copper water glasses, which can be used as mule glasses at home, blue champagne toasting glasses, local beer from Widmer, and the tequila shot glasses serve as a place-card, too – Himalayan sea salt shot glasses with white paint pens are all you need for this DIY project. The dishes: IKEA including the placemats. The Monstera leaves can be used without the mat for guest table placemats. Flatware is bamboo, some of our local rental companies have similar versions for rent. The chopsticks by IKEA. The menus printed and designed by elli.com and they incorporate beachy wavy vibes combined with the watercolor trend that is so popular this year! The napkins and velvet bone tablecloth from bbj linen. The tropical floral design starts in a copper Mayan bowl on the table and flows down to a clear glass tall Pilsner vase filled with rocks. We chose orange roses, in season local bright pink anenome, yellow lilies, the local orange butterflyranunculus were fire! The traditional pink protea and bird of paradise were the only traditional tropicals.